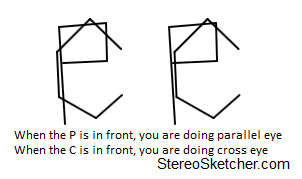 StereoSketcher is a stereoscopic 3D drawing toy. To crop your image before uploading, just resize your browser window. This was tested in Firefox during development, results in other browsers may vary. Laptop screens are unkind to the red/cyan images. Please note that the grayish polarized 3D glasses you get from move theaters nowadays will not work for StereoSketcher. Some colors work better than others in red/cyan mode. i.e. red doesn't work well.